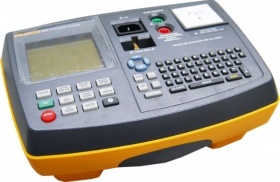 Fluke is known world wide for its manufacture of electrical testing equipment. Fluke produce test equipment for every environment, situation and location. The Fluke 6200 and Fluke 6500 are the two portable appliance testers which are supplied by this manufacturer which are compatible with bar code scanners and printers. The Fluke 6500 is an advanced and featured packed Portable Appliance Tester. It contains a unique compact flash memory drive, QWERTY keyboard and very fast testing times.